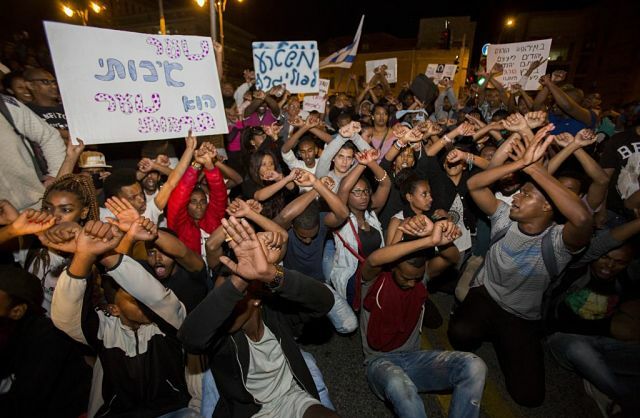 JERUSALEM — Hundreds of protesters, mainly members of Israel’s Ethiopian immigrant community, have rallied in Jerusalem, pelting the police with stones and bottles and denouncing what they said was discrimination against them because of their race. Police spokeswoman Luba Samri said two officers were hurt in Thursday evening’s protest. The protesters blocked roads and marched toward Prime Minister Benjamin Netanyahu’s residence. Jerusalem Mayor Nir Barkat arrived at the scene to appeal to the protesters to restore calm. Tempers flared this week when a video emerged of an Ethiopian Israeli in army uniform being beaten by police in an alleged racist attack. Netanyahu condemned that attack. Thousands of Ethiopian Jews live in Israel, many of them secretly airlifted in 1984 and 1990, but their absorption into Israeli society has been rocky.